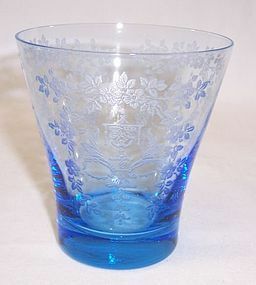 This really pretty Gloria Blue Mikado, Number 808 Etch, 3 1/2 inch high 8 Ounce Tumbler was made by New Martinsville Glass in the 1960s. This Tumbler measures 3 1/8 inches in diameter at the top and is in very good condition with no chips, cracks or scratches. We guarantee items to be as described. THANK YOU.